NARTH, was founded in 1992, by Benjamin Kaufman, M.D, Charles W. Socarides, M.D. 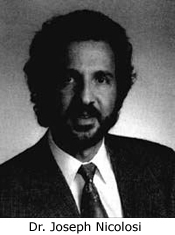 , and Dr. Joseph Nicolosi in response to the American Psychiatric Association’ (APA) removal of homosexuality from its list of mental disorders in 1973, an action they all vehemently opposed. Dr. Nicolosi has long been the President of the organization. In 1977, he graduated from the California School of Psychology near downtown Los Angeles. In a 1996 study published by the American Psychological Society, the school was ranked 176th out of 185 graduate programs. NARTH proclaims to be a secular organization but often supports reparative therapy and participates in ex-gay events conducted by an array of religious organizations including Focus on the Family’ Love Won Out symposium. In many instances, NARTH’ rhetoric is indistinguishable from sectarian organizations. Confronted with protesters at their 2006 national conference in Orlando, NARTH instructed its members to “sing a hymn or pray instead,” according to Mother Jones magazine, in its Sept.-Oct. 2007 issue. Some of NARTHs approximate 1,000 members are in fact ex-gays and many have close ties to churches, even holding dual degrees in divinity or religious studies as well as in Psychology and Psychiatry. NARTHs website contains links entitled “Theological issues”, “Political issues” and “Gay activism in schools”. Another disturbing aspect of these organizations is that they seek to “prevent” toddlers from becoming gay. If a child shows signs of atypical gender behavior, NARTH suggests ex-gay therapy. Indeed, the group takes clients as young as three years old. The fallout from this controversy helped cause NARTH’s co-founder and president, Dr. Joseph Nicolosi, to be voted out of his job at the group’s annual meeting. A new President is expected to take the helm in 2008.